WITH its mosaic flooring, rustic beams and dark wooden wall panels, the ambience at Old Street Bak Kut Teh restaurant in Westgate is distinctly 1960s. The iPads on their tables, however, are every bit a 2010 innovation. Old Street Bak Kut Teh serves tender, juicy pork ribs prepared in the traditional herbal broth as well as other succulent variations. Since opening its first outlet in Upper Paya Lebar Road in 2010, it has expanded to three more outlets in Westgate, Funan Digitalife Mall, Kallang Wave Mall, with a fifth slated to open at Sun Plaza in December. Technology has been a steady companion as the chain grew, boosting service turnaround time and streamlining operations for optimal efficiency across all its outlets. 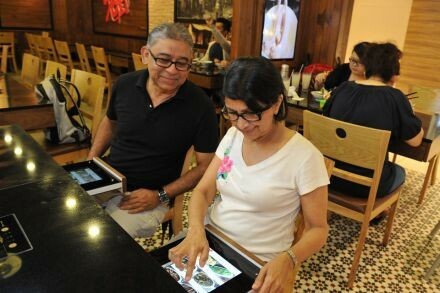 In 2013, Old Street Bak Kut Teh began rolling out an Aptsys e-menu solution which allows diners to place their orders using a tablet at their table. With the multi-language capabilities of the iPad, diners can easily switch between English and Chinese, depending on which language they are more comfortable with. The e-menu can also be updated easily by the outlet's administrator to push out new promotions and the latest additions to the menu. Jason Lim, managing director of Bak Kut Teh Pte Ltd, recounted how, in the past, customers had to write down their orders on paper chits, which they would pass to service staff to key into the point-of-sale system. The chits would then be passed on to the kitchen to prepare the food. This took too long, and queues would form. The e-menu system has changed all that. "A key feature of the solution is that it improves our efficiency in serving our customers," said Mr Lim. Once diners place their orders on the tablet, the confirmed orders are sent directly to the kitchen printer through a wireless network. Instead of waiting 25 minutes for their food, diners can now be served in 10 minutes. This saves valuable time for customers and increases staff productivity, allowing them to focus more on improving customer service, said Mr Lim. He estimated that business has improved 30 per cent with the e-menu system. Also, by capturing sales records more accurately, the system also gives the company better control over its cash transactions. With the information collected through the system, Old Street Bak Kut Teh has also been able to make smarter procurement and planning decisions. As Mr Lim explained: "Simple data analysis on customer order trends and preferences helps us forecast demand. Our procurement team can now better manage the procurement choices and quantities, hence reducing food wastage." When it first embarked on its information technology (IT) journey, the main challenge that Old Street Bak Kut Teh faced was preparing its team for the transition, and convincing them that this would help them in their work and enable the outlets to improve their operations. "As most of our existing workforce are middle-aged or older, they were worried that they would not be able to handle it, so we had to make sure that the system was very user-friendly," said Mr Lim. After evaluating several IT service providers, the company decided to go with Aptsys "because they were very friendly and helpful, and willing to grow with us". Implementation of the e-menu system at the first Old Street Bak Kut Teh outlet took about six to eight weeks, and half that time for each subsequent outlet. The entire process included programming, data entry, networking, getting the workflow correct, implementation, training and commissioning. For Old Street Bak Kut Teh, the deployment of technology has certainly been a boost for its operations and created a positive image for the restaurant chain. "Ever since we deployed this system, it has become very important to our operations and helps set out the standard operating processes for all our new outlets," said Mr Lim. "Our customers also perceive us as being very modern, receptive to new and innovative ideas and solutions." But Mr Lim remains mindful that the food & beverage (F&B) sector is a services business, and people will always have a key role to play. "We do not automate and replace all the functions in the restaurants with technology as it takes away the human touch and interaction," he said. Since 2010, small and medium enterprises (SMEs) have worked with the Infocomm Development Authority of Singapore (IDA) to tap on iSPRINT (Increase SME Productivity With Infocomm Adoption & Transformation), which supports the deployment of technology for business productivity. In August this year, iSPRINT received a S$500 million boost from the ICT for Productivity and Growth (IPG) programme with three new calls to action: first, for SMEs to pilot sector-wide solutions that can change the business workflow of the sector to improve productivity; second, for more SMEs to deploy sectoral solutions that have been proven to be effective; and third, for SMEs to make use of the high-speed connectivity in Singapore to reap the full benefits of important technology capabilities such as cloud computing and analytics. In his speech at a major SME conference this year, Yaacob Ibrahim, Minister for Communications and Information, said that technology has become increasingly pervasive and accessible, and SMEs must ride this wave to compete, grow and achieve new heights. IDA seeks to continue our partnership with agencies, trade associations and chambers, professional bodies as well as the ICT (information and communications technology) industry to help more SMEs take advantage of technology for productivity and business growth.